Just a day after the Chicago Teachers Union rejected the school board's latest contract offer, Chicago Public Schools is announcing cuts. CEO Forrest Claypool says the district is still working to avoid teacher layoffs, but some staffers will lose their jobs in order for the district to save money. Support staff at CPS will be the focus of this round of cuts. A principal we spoke with said that means clerks who handle payroll and accounting, purchase orders for supplies, those who make sure that substitute teachers are called in when a teacher is out sick. It also means teaching aides, the staffers who work children on individualized education plans, or IEPs. The CTU is saying this will add up to more than 1,000 staffers. The district isn't counting heads yet, but telling principals that they'll find out in the next one to two days exactly how many positions will be cut. 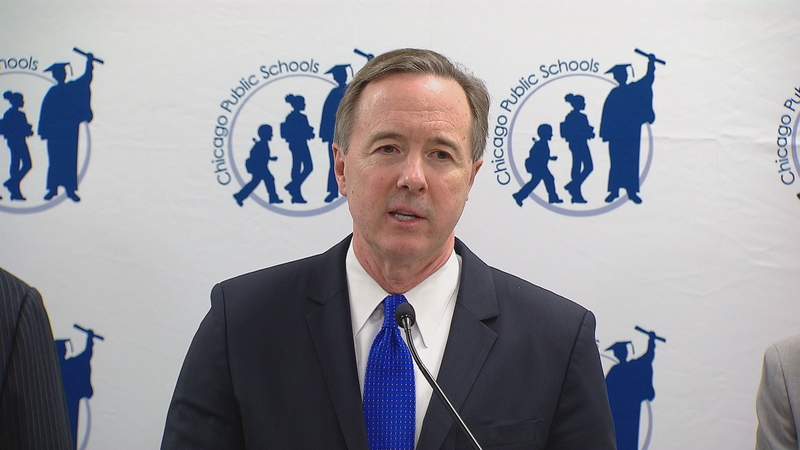 What's more, CPS CEO Forrest Claypool says there are other changes happening that he'd hoped to avoid. Click image to open letter. In a letter he sent to union boss Karen Lewis, Claypool said the district would have to discontinue the 7 percent pension pick-up the district had been making for teachers for a few decades, and that it should save the district $130 million annually– about half that this fiscal year. The cuts to school support staff would add up to $50 million in savings. And he plans to use a waiver to repurpose title one and title two funds to save $50 million. "We do not want to do this," Claypool said at a news conference Tuesday. "I would be the happiest guy around if next week we had an agreement with the teachers union and we could rescind the process on these steps. We do not want to take these steps. We're still hopeful that we can reach an agreement with the union, but we have reached the point where we can no longer delay taking administrative actions necessary to realize these savings, given the threat to our district from this massive budget deficit." Between cuts made to central office employees a couple of weeks ago and the pension and staff cuts being made today, Claypool says they're reducing the deficit by a total of $320 million. In addition, he says despite rumors it has good momentum with its investors and it plans to proceed with its $875 million bond sale tomorrow. The district says this was a very good offer for the teachers, and would've put the district on much more stable financial ground. They say the contract would've raised teacher pay, prevented teacher layoffs, given teachers more autonomy in the classroom and restricted charter school expansion. Board chair Frank Clark was with Claypool today and says they're not giving up. Gov. Bruce Rauner also weighed in on CTU's rejection of the contract. The governor says the district proposed an unaffordable contract and that he hopes this rejection is a wake-up call for the mayor and taxpayers. He says that contract was just more kicking the can down the road, and the teachers union rejected that. Rauner also said though, that the union has complete control and it's the reason the district is broke. Click image to open letter. In a letter he sent to the Illinois State Board of Education, he's instructed staff there to start looking into whether Chicago Public Schools meets the criteria for a state takeover under state code, and also to start identifying possible candidates for the Independent authority, if one is appointed. This is all contingent on whether or not legislation allowing the state to take to take over CPS passes in Springfield. About that legislation, Senate President John Cullerton, in a statement said the law doesn't allow for a state takeover of CPS, and that it's not going to happen. Claypool as well, called it a non-starter. We'll get more of his thoughts on all of this when he joins us here on set tomorrow night.